Also I am afraid if I keep him home he will keep my attention all the time...lately if I am around he wants to keep me focused on him all the time...do we have to work on getting him again more independent...he has been taken care of from different members of the family and that is also why he started in nursery. Now I am back home and I have to reset the schedule and I am feeling insecure about what to do. I also need some practical simple advice on how to teach the rest of the family how to keep the order, we have improved but still it is not enough. If you can keep him enrolled in the school a few days a week, that is ideal. Maybe he can go three half days a week instead of five... He is entering his Sensitive Period for Order, which will get stronger (2 1/2 to 3 1/2). So try to keep him in one more year. Then, in the fall of 2012, he will be 3 1/2 or 4 and you can work with him at home if you don't want to spend more money for another year at Waldorf. By then there will be more activities he can do at home, independently. But if you need to keep him home this summer/fall, you can use a timer when you interact with him (set it for ten or fifteen minutes--when the timer goes off you go and do your work, etc. ); or limit the activities you do together to three at a time (after you do three activities with him, or read three books, etc., you go and do your thing). We did this with our son since he is an only child. He may fuss at first, but over time it will be his new routine. You can't, however, try and control how (or how long) other family members interact with him. 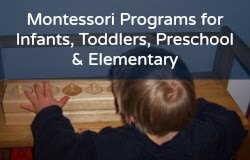 And if there will be other family members interacting with him on a regular basis, you will need to be a lot more relaxed and flexible about your home (Montessori) environment.